Rubus allegheniensis.© Copyright Sheryl Pollock 2011.discoverlife.org (Accessed 5/2015). 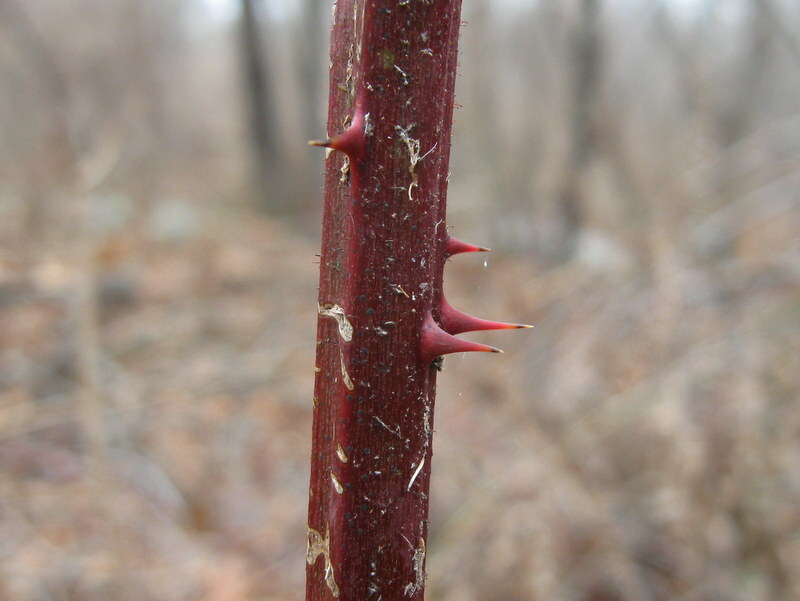 Rubus allegheniensis is a prickly, arching shrub to 3 m tall; colonial; stems stout, prominently ridged, young stems finely glandular-hairy, sometimes glandular, thorns along main stems fairly straight, bases long, flattened side to side, canes upright to arching, green to dark red. Leaves alternate, palmately compound, 5 leaflets, hairy below, terminal leaflet egg-shaped, about 15 cm long, widest at or below middle, margin toothed, thorns of leaf stalks and midribs hooked, leaf stalks glandular-hairy. 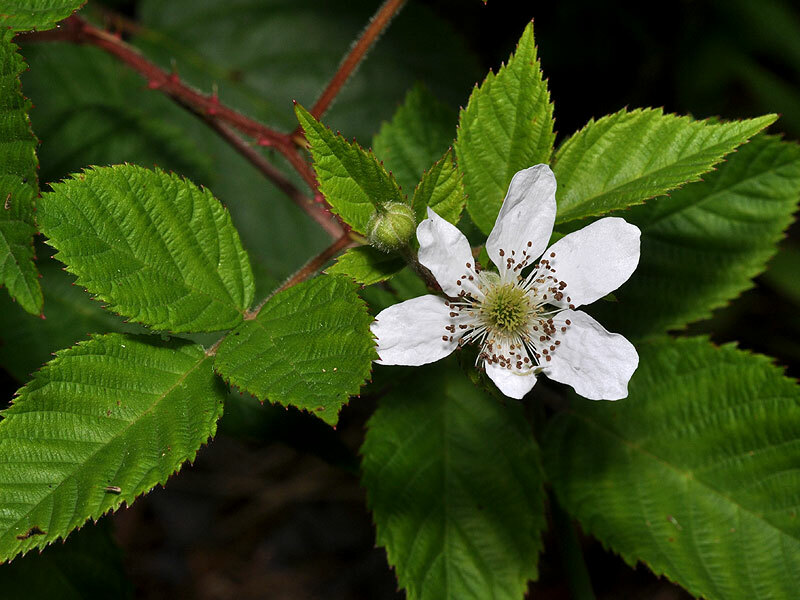 Rubus allegheniensis.flower. copyright David G. Smith.discoverlife.org. (Accessed 5/20150. Flowers white, 2 cm wide in racemes on new growth branching off of primary stems of the last season, stems of inflorescence densely glandular–hairy, flowers insect pollinated; blooms May-June. 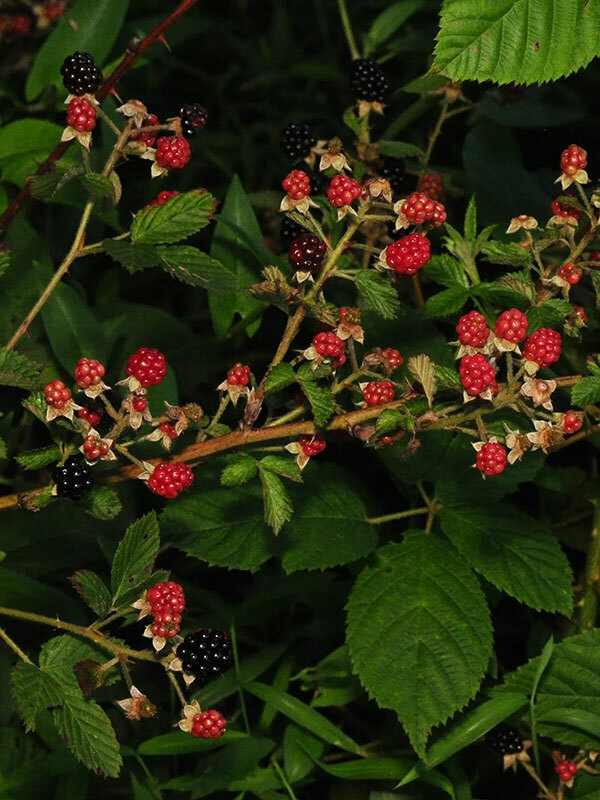 Fruit fleshy, of multiple 1-seeded black drupes (unripe fruit red) adhering to receptacle, shiny, June-Aug. Seed load 23% Pulp nutrients: water 89%, lipids <1%, protein 9%, CHO 49% (White 1989). Fruit eaten by numerous birds and mammals (Olmsted and Curtis 1947). Habitat: Open areas, tolerates poor soil. Wetland hummocks and edges, to dry upland and fill. Typically mixed with Phragmites, herbaceous perennials (goldenrods) or greenbrier in burned over or otherwise disturbed areas. Wide tolerance of soils and moisture, grows in fill soils, pH 4.5-7.5. Moderately tolerant of flooding, drought, soil compaction, shade (grows poorly, does not flower in full shade). Intolerant of salt (Hightshoe 1988). Shaded out by closing forest canopy but may persist vegetatively. Stems and leaves eaten by rabbits and deer (Martin et al., 1951). Rubus allegheniensis.fruit.Copyright David G. Smith.discoverlife.org. (Accessed 5/2015). 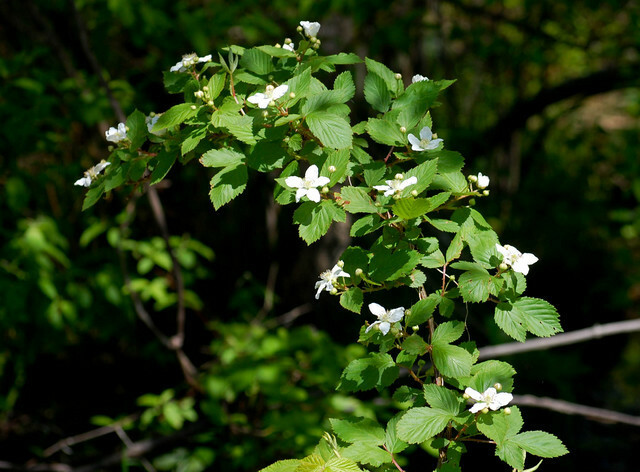 Rubus allegheniensis.stem .Josh Fecteau.joshfecteau.com (Accessed 2/2017).